Matching accessories have become kind a big thing for me. When I’m wrapped in the warmth of a comfy hand knit hat, a cozy hand knit cowl, and toasty hand knit mitts, I like them to match, or complement each other, either by sharing the same stitch pattern or being worked in the same yarn. When my knitted accessories complement each other it allows each piece to stand out without competing against the other accessories that I’m wearing. Matching accessories make me look more polished and put together, even on days when I might not feel very polished or put together. So, I’m on a mission to create sets of matching knitwear accessories in my favourite colours using my favourite yarns and stitch patterns. The Juniper Collection includes socks, a cowl, a hat and mitts. I chose this specific yarn because it’s one of the softest, squishiest yarns that I’ve ever had the pleasure to knit with and it feels divine against my skin. Also this bluish/purple that Nicole (the dyer at Spinnacle) created, really reminds me of the juniper berries that were on the juniper bushes outside of our house when I was growing up. The Juniper Collection is being released in stages. Juniper socks were released earlier this year, Juniper hat was released today (you can download it with a $1 discount by clicking here), Juniper Mitts will be released next Thursday August 23rd, 2018, and Juniper Cowl will be released on Thursday August 30th, 2018. If you purchase the collection today you pay $15 for all 4 patterns (each pattern will automagically be added to your library upon its release). The price will increase with each new release. If you've previously purchased Juniper Socks, the purchase price will be reduced accordingly. You can find the Juniper Collection here. I love words; I’m a logophile. One of my favourite words (I have many) is lenity. Lenity is derived from latin. It’s a noun and is defined as ‘gentleness; kindness’. I love that it’s a noun; instead of describing something or someone as expressing gentleness or kindness, it is gentleness and kindness. It somehow sounds more permanent and tangible when it’s a noun. I also love knitting fabric that is on a bias, like this stitch pattern. It plays well with solid, tonal, variegated, and patterned yarns. The stitch pattern is much easier than it looks. There is a little bit of trickery in Round 16, but it’s literally just moving a marker and yet it makes the entire stitch pattern flow seamlessly along as you knit. Lenity is worked from the cuff down and cable pattern on the bias on the front & back of the leg, and top of the foot. This sock features an afterthought star heel with optional gussets, and a star toe. Lenity is available with a $1 discount until Monday August 13th, 2018 (no coupon code required). You can find it here. I'm away this week enjoying some family time on the west coast, so there isn't much of a blog post, but I want to let you know that my video tutorials are now available on my website. They were previously only available by private link, but now there available for everyone! You can find them by clicking on the 'Resources' tab at the top of this page. I plan to add more video tutorials in the future. What tutorials would you like to see? Let me know in the comments. I'll be back next week, until then Happy Knitting! Meraki is one of my favourite words (is it weird to have favourite words?). Meraki is Greek, originally derived from the Turkish word merak and means “to do something with passion, with absolute devotion, with undivided attention; to put something of yourself into whatever you’re doing." I think this is one of the most beautiful words in the world and perfectly describes the joy I feel when I create something from nothing like this new sock design. The goal is to hang onto that feeling of meraki and carry it with us throughout the rest of our day as we we go about our every day business of tasks and errands. Meraki is contagious and if we can insert a little bit of that feeling in everything we do, we can infect the world with joy. The world can use more joy. I hope you knit this sock with meraki and feel joy with every stitch, joy that you can hang on to for the rest of your day. Meraki is worked from the toe up and features a delicate cable pattern on the top of the foot. After a Fleegle-style heel, the stitch pattern continues on the front of the leg to the ribbed cuff. Instructions are included for 4 circumferences and the foot length is customizable. The pattern stitch is both written and charted, and the pattern includes a schematic. You can download Meraki with a 20% discount (no coupon code required) until Monday July 30th. You can find the pattern here. Paradise Fibers and I are giving away their July 2018 Subscription box! To enter go to www.DanaGervaisDesigns.com/blog/paradise and comment with your favourite fiber. The winner will be drawn on Monday July 30,2018! Good Luck! Paradise Fibers and I have teamed up to give away their July subscription box! To win, all you have to do is comment on this post with your favourite fibre! I'll choose a winner on Monday July 30th! I'll announce the winner on Instagram, Facebook, and I'll update this post! One of the by-products of being a sock knitter is how quickly we accumulate small amounts of leftover sock yarn. Amounts that are big enough to wind into a small ball, but not quite big enough for a project. 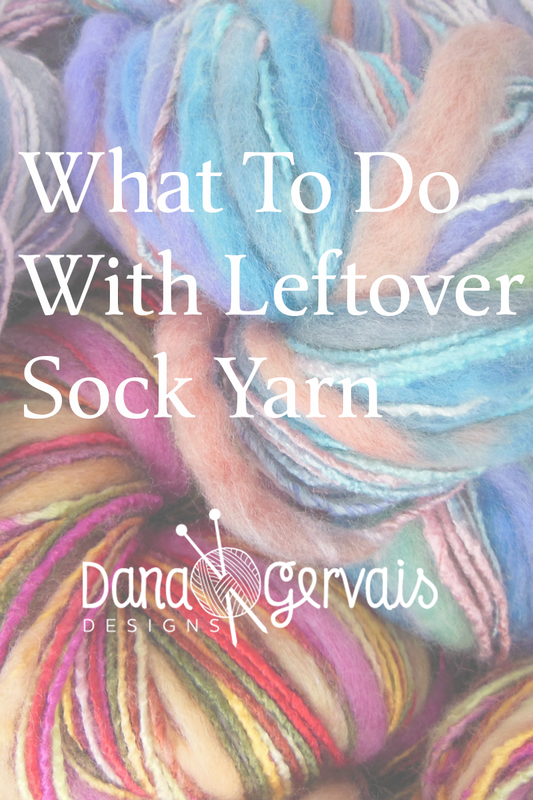 What does a sock knitter do with leftover sock yarn? Sometimes I design socks that use up odds and ends, like Diagon Alley. Diagon Alley uses scrap yarn for the cuff, heel, toe and short rows. Create a magic 8 ball (which is a cool looking skein of yarn comprised completely of scraps). Directions for making a magic 8 ball can be found here. Knit up a pair of one-of-a-kind scrappy socks; some pattern ideas for scrappy socks can be found here. 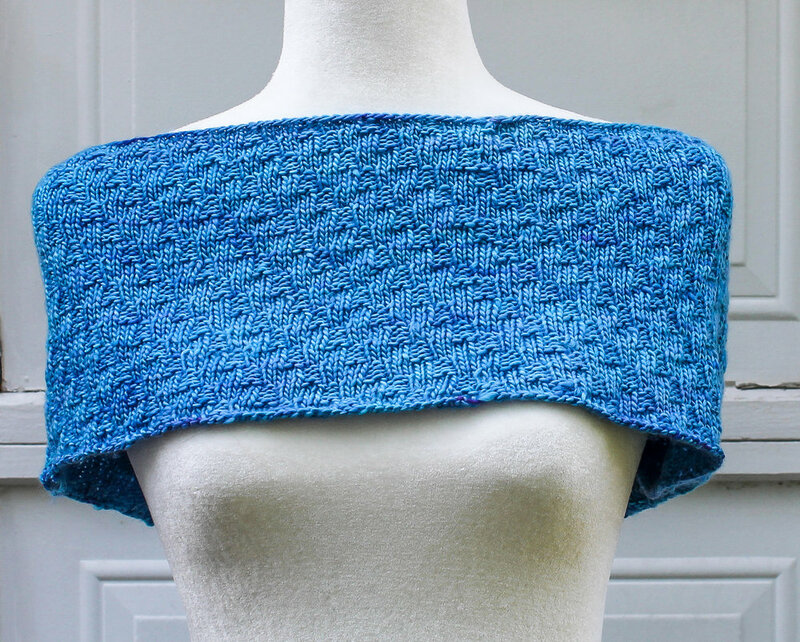 This 'Fiddly Bits Cowl' has been in my queue for ages, I think it's gorgeous! Mitre square blankets are really popular right now, here is an article about how they are made. The Yarn Harlot's Traveller's Life Afghan is another scrappy project that has been in my queue forever. If you have a lot of patience and a strong sense of commitment, you could make Sock Opus tights. My 'girlfriend gift' for my girls this Christmas will probably be a pair of earbuds wrapped in these cute earbud cosies. These Modicum Mitts would be lovely and warm. What do you like to do with your leftover sock yarn? New Pattern Alert! With Arch Shaping! This design is very personal and special to me. This sock is inspired by, and named for my Grandmother, Neta. Neta is my paternal grandmother, and aside from being the kindest, most nurturing soul I’ve ever known she also taught me to knit and to make socks. She even managed to remain patient while teaching pre-teen me how to execute a successful Kitchener stitch, which speaks volumes about her capacity for patience and understanding. She was a finesse knitter, and she and her knitting have inspired every stitch I’ve ever knit. Neta is worked from the cuff down and features an easy to memorize stitch pattern on the front and back of the leg. This pattern features an Eye Of Partridge heel flap, and arch shaping through the gusset and instep stiches. The stitch pattern continues on the top of the foot until the pattern stitches are consumed and replaced by stockinette stitches. The sock ends with a wedge toe that is grafted closed using Kitchener stitch. This is the first pattern I've written that includes arch shaping. Many of you with high insteps have been asking for arch shaping, and when you ask I try to deliver! Instructions are included for 4 circumferences and foot length is customizable. The stitch pattern is both written and charted. You can download Neta with a 20% discount until Monday July 16th (no coupon code required). You can find the pattern here. Swatching is important if you want the finished piece to be the size stated in the pattern and also to make sure that you have enough yarn to complete the project. Most patterns will state gauge after blocking so you will have to knit a gauge swatch then wash it and dry it as you plan to wash and dry the finished project (or as per the directions on the yarn tag) to get an accurate measurement. Gauge is the measurement of how many stitches per inch/centimetre and how many rows per inch/centimetre the designer got when knitting a certain stitch pattern with a certain sized needle. In order to achieve the same size project as the pattern, you need to match the designer's gauge. This means you knit small sample squares, wash them, and measure them until you find the right combination of needles and yarn that give you the gauge in the pattern. There is no right or wrong gauge. For example, gauge for a sock pattern might be 8 stitches and 12 rows per 1 inch/2.5 centimetres using 2.25mm (US 1) needles in stockinette stitch after blocking. That is the designer’s gauge. The gauge s/he got knitting the sample socks for this pattern. Your gauge when working the same pattern stitch with the same size needles and yarn may be different. And that’s ok.
What If You Don’t Get Gauge? Using our example, if you have fewer than 8 stitches per inch, you need to re-swatch with a smaller needle size. If you have more than 8 sts per inch, you need to re-swatch with a larger needle size. Click here to download a worksheet to help you keep track if you need to make multiple gauge swatches. What If You Can’t Get Both Stitch Gauge And Row Gauge With The Same Size Needle? As a rule, stitch gauge is more important than row gauge. If you can only match one, always go for stitch gauge. You can compensate for row gauge by working more or fewer rows, but it’s much trickier (and requires a lot more math) to compensate for stitch gauge. Gauge is a finicky and elusive beast. Everything affects gauge. Your gauge can change from wooden to metal needles, from straight needles to DPNs, from cotton yarn to wool yarn. You probably have a different gauge when working flat than you do when working in the round. This is why you need to swatch using the needles and yarn that you intend to use for the project, in the knitting style you will be using for the project. Using socks as an example, socks are worked in the round, therefore, your gauge swatch needs to be worked in the round. If your sock will be knit using DPNs, your gauge swatch will need to be worked with DPNs. Ditto for Magic Loop. Ditto for 2 circular needles. If the designer gives gauge in multiple stitch patterns, you need to swatch in all the stitch patterns. Just because you match gauge in stockinette stitch, doesn’t mean you’ll also match gauge in a lace or cable pattern. Knitting in the round is different than knitting flat because there are no wrong side rows, so you need to work your gauge swatch without wrong side rows. However to make swatching quick, and consume as little yarn as possible, there is an easy way to work a gauge swatch in the round but flat. Click here to see a video where I demonstrate swatching in the round. Westney & Meandering are now available for download on Ravelry. Previously available exclusively in the book, Artful Arches, Westney & Meandering are both available in my Ravelry store as of today. It’s amazing what a few strategically placed slipped stitches can do when they’re combined with variegated yarn. Slipped stitches have a magical way of showing off the colour variegations without getting lost or competing with the yarn. Slipped stitches and variegated yarn are a knitterly symphony; on their own they’re each lovely, but together they both become even more beautiful. I think most of us have at least one gorgeous skein of variegated yarn in our stash that needs just the right pattern to do it justice, and both of these patterns were designed with that special skein in mind. You can download Westney and/or Meandering with a 20% discount (no coupon code required, the discount will appear automagically at checkout) until Monday July 2nd, 2018. First of all, I need to tell you that you’re awesome! You make my job possible and will never really understand how much that means to me. This week I put out a call on social media looking for blog post ideas and you delivered. Big time. You’ve given me enough feedback to keep this blog in fresh posts for a long time, and best of all, I know the content will be relevant for you because you suggested it! This week’s topic is ladders: how to avoid them, banish them, and make them a thing of the past. Laddering happens when working in the round; it’s a gap between the last stitch of one needle and the first stitch of the next needle. Sometimes this gap, or ladder, is small and disappears when the piece is blocked and sometimes it’s wider and quite obvious, even after blocking. The horizontal strands of yarn that are stretched between the two needles resemble the rungs of a ladder, hence the term ‘ladder’ or ‘laddering’. HOW CAN YOU AVOID LADDERS? Ladders result from the stitches between 2 needles being stretched, so when switching needles, pull the working yarn on the first 2 stitches of the new needle more tightly than you normally would to pull those stitches closer together. If you don’t mind a line of twisted stitches (it can be a design element), you can work the first stitch of the next needle through the back loop. This seems to tighten the stitch and close the gap. I find I have ladders when the first stitch of a needle is a purl stitch (my gauge differs between knit and purl stitches) so I try to arrange my stitches so that the first stitch isn’t a purl stitch. Use an extra DPN. If you’re working on 4 DPNs (where the stitches are divided among 3 needles and you knit with the 4th needle) you can try working on 5 DPNs. This will minimize the stretching between needles. You can shift your stitches every few rounds so it isn’t always the same stitch at the start of a new needle (be sure to use a beginning of round marker so you don’t lose track of the beginning of round when you shift stitches around). Consider switching to a different method of working in the round. If you have a ladder problem with DPNs, try magic loop or knitting with 2 circular needles. What tips and tricks do you have for avoiding ladders in your knitting? Tell us in the comments! The Latin word flectere, meaning “to bend” or “to curve,” and its form flexus give us the roots flect and flex. Something flexible can be bent without breaking. I love the combination of slipped stitches with variegated yarn. It’s a combination I never tire of or find boring to knit. This pattern was inspired by this gorgeous variegated yarn by Malabrigo Yarn (the colourway is Acro Iris). The short colour repeats combined with the curve and bend of the stitch pattern manage to complement each other without competing with each other, which is a good outcome not only for hand knit socks, but for life in general. This sock starts with a star toe and the stitch pattern on the top of the foot. Then, after a short row heel, the stitch pattern continues on the front and back of the sock. When knitting the sample socks, I reversed the order of the charts for the second sock so that the pattern would be the opposite of the first sock, though this modification is not instructed in the pattern. Flectere includes instructions for 4 circumferences and the foot length is customizable. You can download Flectere with a 20% discount until Monday June 18th, 2018 (no coupon code required, the discount will automagically be applired at checkout)! Much like heels, (you can find the heel version of today’s post here) toes are a personal preference. The type of toe you prefer will depend on the anatomy of your individual foot. The good news is that (most of the time) toes are easy to modify without having to do very much math or rework an entire pattern stitch. They’re also fairly easy to re-engineer to accommodate toe up or cuff down construction. My advice is always to try all the things (pertaining to knitting) so you can decide for yourself which toes fit you and which ones don’t and which toes you love to knit and which toes you hope you never have to knit again. Ever. Here is a summary of some of the most popular toe constructions, their advantages and disadvantages, and when you might use them. There are other toe constructions out there, but these are the ones I come across most often when designing and tech editing sock patterns. Do you you have a favourite type of toe construction? Help Me Choose My Next Sock Design! Which one of these 2 swatches needs to be released as a sock pattern on July 12th? Wrapping myself in cozy, warm stitches on a chilly day is one of the most comforting feelings in the world and actually makes me look forward to the chilly mornings of fall and the frosty days of winter. When I’m wrapped in the warmth of a comfy hand knit hat, a cozy hand knit cowl, and toasty hand knit mitts, I like them to match, or complement each other. When my knitted accessories complement each other, either by colour, or stitch pattern, it allows each piece to stand out without competing with the other accessories that I’m wearing. Matching accessories make me look more polished and put together, even on days when I might not feel very polished or put together. So, I’m on a mission to create sets of matching knitwear accessories in my favourite colours using my favourite yarns and stitch patterns. The Ahlie collection includes socks, a cowl, hat and fingerless mitts. I chose this specific yarn because though I love all colours, I’m especially attracted to greens. Most shades of green resonate with me on a deep level. This attraction caused me to immediately fall in love with Tree Moss by LakeKnit Yarns. I was also totally intrigued by the fibre (Polworth) as I’d never worked with it before. It’s soft, durable, and has a bit of stretch. It feels wonderful to work with and the tonal green with black speckles that are almost donegal-like really help make the Ahlie stitch pattern stand out. I found that this yarn both stretched a bit and became even softer with blocking. You can download the Ahlie collection for $14 (the regular price is $18) until Monday May 28th. If you've previously purchased Ahlie Socks, the price will be discounted automagically at checkout to reflect the previous purchase. If you'd like to download just 1 Ahlie pattern, each pattern is available with a 20% discount until Monday May 28th. Father's Day Finest Socks is 20% off (no coupon code required) until Monday May 28th. You can find the pattern here. A free scarf pattern is included with the sock pattern. Use very soft yarn. Bunions can be sensitive and tender and benefit from some extra softness and cushioning. Use a thicker yarn to provide extra cushioning around the bunion. This can be a bit tricky because if the yarn is too thick the wearer’s shoes might not fit properly, so it will take some trial and error. Work increases around the bunion. Warning: math ahead! If the foot circumference before the bunion is 8 inches and the foot circumference including the bunion is 9 inches and your stitch gauge is 8 stitches per inch, you can increase an extra 8 stitches (4 stitches on either side of the toe) leading up to the bunion and then decrease those extra stitches after the bunion. This becomes tricky if you’re working a stitch pattern and may mean either stopping the stitch pattern early (if you're knitting cuff down) or starting it a bit late (if you’re knitting toe up). Create a small gusset for the bunion. This is my favourite option, because I love short rows, but it will result in anatomical socks (socks that have specific left and right feet that aren’t interchangeable). When you reach the bunion-part of the sock, you create a tiny short row heel where the bunion is to cushion and accommodate the bunion. Again, you’ll need to know the circumference of the foot with and without the bunion and again, this will disrupt any pattern stitch that you’re knitting on the sock. Do you have experience knitting socks to accommodate bunions? I'd love to know what tips and tricks you use. In the depths of winter when Carolien (the dyer at Colourful Creativity) and I were brainstorming ideas for a spring sock design, we were both inspired by the first flush of spring. That magical time when the world wakes up from its long winter nap and trees are re-born from brown and barren to lush with foliage in bright shades of green. That time when the sun is so bright and warm that it makes everything it shines on look a little brighter. When the first blooms of the season open and their burst of colour changes not only the landscape but everyone’s mood; even the birds seem to sing more loudly and happily. The first word that came to mind for me was halcyon. Denoting a period of time in the past that was idyllically happy and peaceful. This pattern and this yarn are designed to remind you of the halcyon days of spring when the world feels (if only for a moment) idyllically happy and peaceful. The yarn is called 'Spring Fling' and it's a limited edition yarn that's being released at the same time as this pattern. You can find 'Spring Fling' here. (The rainbow donegal specks are really cool - this was my first time working with them and I'll definitely be knitting with this yarn again). 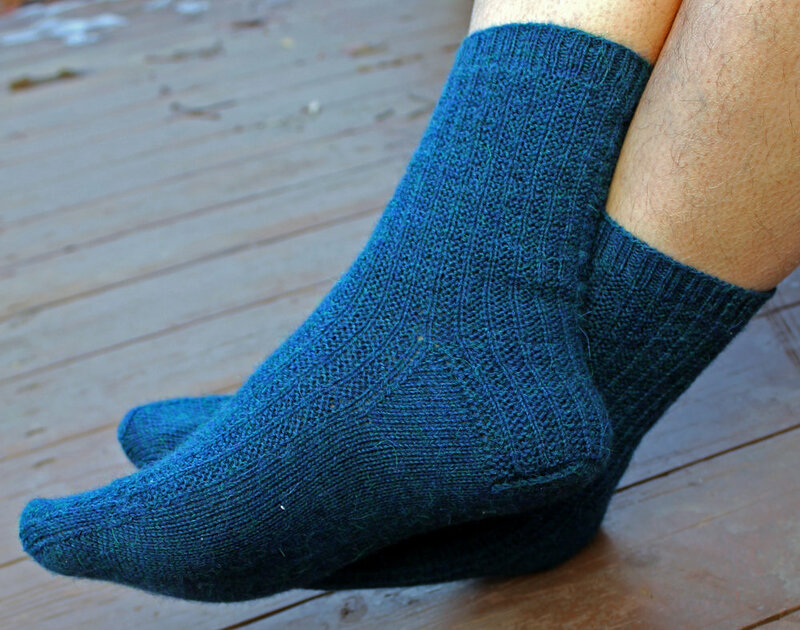 Halcyon is worked from the toe up and features ribbing across the top of the toe and foot. Gusset increases are moved from the sides of the foot to the instep to accommodate the emerging floral stitchthat starts on the top of the foot and continues up the front of the leg. The sock ends with a ribbed cuff. The pattern is graded for 4 circumferences and foot length is customizable. Halcyon is available with a 20% introductory discount until Monday May 14th (no coupon code required, the discount will be applied automagically at checkout). Thanks to your support of Dolores 2 weeks ago, I was able to make a donation to the Centre For Addiction and Mental Health. Thank you. This proves once again that the fibre community is awesome and that knitting really does make the world a better place! See what I did there? I made a heel pun! There are a lot of heel construction options for sock knitters. I'm often asked 'which heel is best?' or 'which heel has the best fit?' or 'What heel do you recommend?' Truth is, feet are like snowflakes and everyone's are different. The heel construction that fits my feet won't necessarily work well for your feet. Or your spouse's feet. Or your kids' feet. Or your neighbour's feet. Or whoever the lucky, knitworthy recipient of your hand knit socks will be. I urge all sock knitters to try as many different heel constructions as possible to determine what works best for them fit-wise and knit-wise (not only does a heel need to fit you properly, you should enjoy knitting it). Do you have a favourite heel construction? What is it and why? New Pattern Alert! It's a Twofer! This design is inspired by the late Dolores O’Riordan, lead singer of The Cranberries. Her haunting voice and angst-filled lyrics were part of the soundtrack of my life in the 1990s. She was unabashedly authentic and honest and stood apart from artists who were carefully constructed by music studios to project a corporately curated physical look and musical sound. In the days following Dolores’ death, I came across a social media post by Melanie (the dyer behind Baad Mom Yarns ), and she had been inspired to create a custom colourway in tribute to Dolores; I immediately ordered a skein of ‘Monog’ (which happens to be Celtic for ‘cranberry’) and designed this sock. Dolores is worked from the cuff down and features a unique wrap/drop stitch pattern down the centre of the front and back of the leg. The design continues onto the heel flap. The heel is constructed using a unique centre gusset design and has no gusset stitches to pick up. The stitch design continues on the top of the foot and toe. The toe is grafted closed with Kitchener stitch. The pattern is graded for 4 circumferences, and foot length is customizable. A link to a video tutorial demonstrating the stitch pattern is included in the pattern. You can download Dolores with a 20% discount (no coupon code required) until Monday April 30, 2018. In addition, $1 from each copy of Dolores sold will be donated to CAMH until Monday April 30, 2018. Sock By Numbers Toe Up was also released into the world this week. Sock By Numbers isn’t a pattern, it’s a recipe to create a toe up sock using any yarn, any needles, any gauge, for any foot size. This pattern starts with a wedge toe, features a Strong heel (no gusset stitches to pick up!) and ends with a ribbed cuff. This is not a beginner recipe. Some knowledge of sock anatomy is required and spoiler alert: this recipe has a lot of math! If doing math old school (longhand) isn’t your thing, access to a spreadsheet to help is included in the pattern. How do you budget for yarn purchases? Do you fund a separate budget category for yarn purchases? Souvenir yarn is included in our vacation budget. When we plan a vacation and plan how we're funding the vacation, yarn is included. It's a given that I will scope out yarn stores before we even leave our house on vacation and that when we've reached our destination I will go to the nearest LYS and pick up some yarn (preferably yarn and dyers that are local to our vacation destination). Yarn that I purchase to make gifts is included in our gift budget. Yarn that I use to make items for myself, the Husbeast, or the Kidlets comes out of our clothing budget. Yarn that I purchase without a project in mind for no reason other than because it's beautiful and squishy and I *have* to have it comes from our entertainment budget. It takes 10-20 hours to knit a pair of socks (depending on foot size and pattern complexity), so if I pay $30 for a skein of sock yarn, I'm paying $2 per hour of entertainment value (assuming I spend 15 hours knitting with it). I can't even go to a movie for $2 per hour AND when I'm finished with the $30 skein of sock yarn I have a beautiful, useful pair of socks in addition to 15 hours of entertainment. It's a win-win. Knitting is good for my mental health and, therefore by extension, the mental health of those around me. Sometimes yarn comes from our health and wellness budget since it really is part of my health and wellness plan. We also plan my husband's golf hobby by category. It works well for us. How do you budget for your hobbies? A Greynbow is what happens when you combine grey yarn with rainbow yarn! These were really fun socks to knit! The stitch pattern looks so great in so many different yarn combinations, that it was difficult to decide on colours for the sample. Greynbow is worked toe up and features an easy-to-remember yet slightly addictive slip stitch pattern across the top of the foot and the front and back of the leg. Only one colour is used at a time so there are no floats to carry along the back of your work. (disclaimer: colourwork with no floats is my favourite kind of colourwork) The heel flap, gussets, and intsep stitches are worked simultaneously in the round (so there are no gusset stitches to pick up!) and the leg ends with a ribbed cuff. The stitch pattern is both written and charted. The pattern is graded for 4 circumferences and the foot length is customizable. You can purchase Greynbow with a 20% discount (no coupon code required!) until Monday April 16, 2018.